London artist Oliver Malin slams convention with his upcoming exhibition. Canvas? White wall gallery? NO WAY – think – take away, pizza boxes and Kebab House . A breathe of fresh air! Takeaway Dreams brings together a host of characters in recurrent, everyday situations, experiencing & displaying a range of emotions, which all come back to forms of dreaming. If we take dreaming as an active, cognitive process of goal-seeking, the series presents people in the heart of this undertaking – whether reminiscing, dreaming for an infinite present or contemplating an immediate future. The beauty of someone’s expression is that it offers a wealth of possibilities & suggestions, without definite answers, giving rise to the driving force, that is, the viewer’s curiosity about that individual, their life and situation. 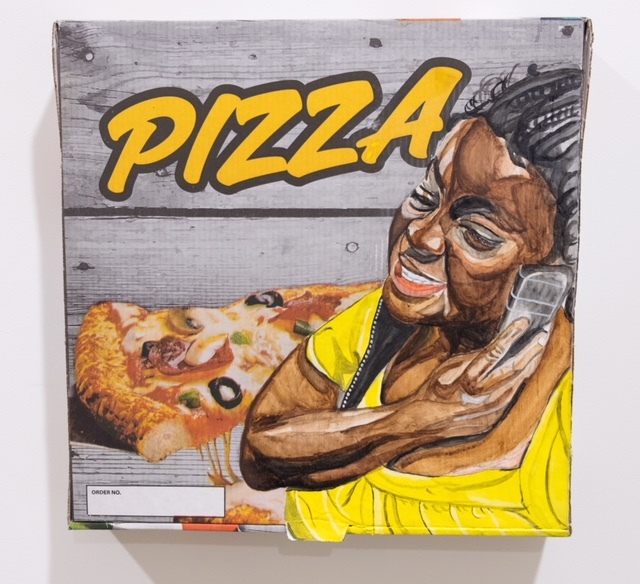 Translating the subject onto the traditionally ephemeral ‘canvas’ of a pizza box, something which rarely lasts longer than its contents, the artist comments on the juxtaposition between the short-lived physical elements and the infinite nature of the dream. In doing so, he invites a wider audience curiosity about the present and prompts a greater observation of those we may have previously ignored or overlooked – not focused solely on the traditionally marginalised, but instead a broader spectrum of those we often fail to consider in daily life. 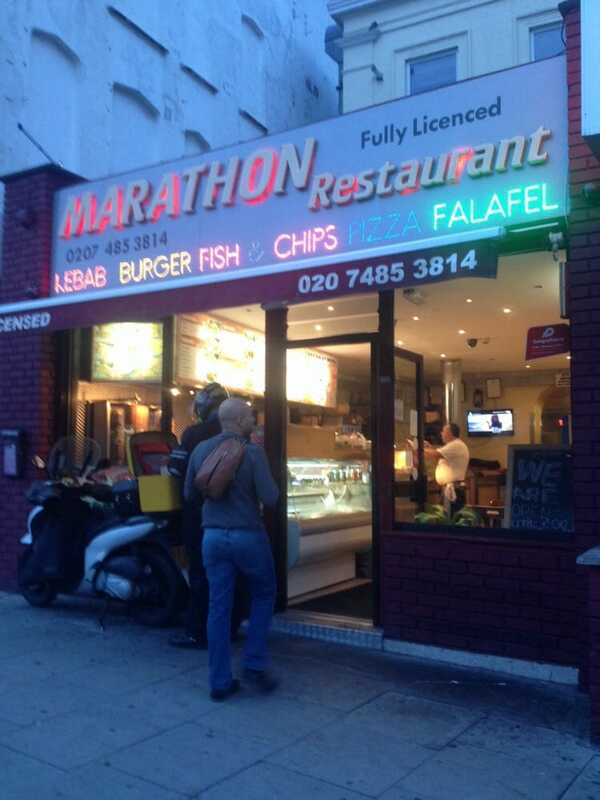 In another bold shift, the exhibition takes place at the famous Marathon Kebab House, taking the artwork out of the conventional gallery space, which has no connection to the work, into its real life environment. Takeaway Dreams represents a simultaneous departure and continuation from the themes, ideas and approaches of Malin’s series We Are Disposable, which formed the basis of his first solo show in 2011 at Camden Town Unlimited (now home to the David Roberts Art Foundation) – the earlier work documenting everyday experiences in a monotone, detailed manner, on a smaller scale using crushed aluminium cans as his canvas. Takeaway Dreams continues the narrative and thematic dialogue, acting as a story board, a snapshot of contemporary elements in society we all are familiar with – however by now injecting colour, the artist moves towards making the subjects more tangible, relatable and accessible. Seeking to represent colour in more vibrant terms than real life, Malin adopts a pallet that favours juxtaposition in the colour scheme and arrangement over uniformity and the more ‘realistically’ subdued. We Are Disposable, while it was an sharp attempt to offer a broad and considered picture of urban city life, painted a relatively sombre undertone. Despite political and social conditions in this country being equally bad, if not worse than in 2010, Takeaway Dreams on the other hand strives to be brighter, languishing not in certainties but, instead, possibilities. exhibited in London (Rebecca Hossack, Graffik Gallery, Art Below) and Miami (Robert Fontaine). ← New exhibition exploring influence of Michael Jackson on contemporary art to open in London and Paris.